This post is a continuation of a series of posts about WebGL. The first started with fundamentals and the previous was about 3D Basics. If you haven't read those please view them first. In the last post we went over how to do 3D but that 3D didn't have any perspective. It was using what's called an "orthographic" view which has its uses but it's generally not what people want when they say "3D". Instead we need to add perspective. Just what is perspective? It's basically the feature that things that are further away appear smaller. Looking at the example above we see that things further away are drawn smaller. Given our current sample one easy way to make it so that things that are further away appear smaller would be to divide the clip space X and Y by Z. You can see that as Z increases, as it gets further away, we'll end up drawing it smaller. If we divide in clip space we might get better results because Z will be a smaller number (-1 to +1). If we add a fudgeFactor to multiply Z before we divide we can adjust how much smaller things get for a given distance. Let's try it. First let's change the vertex shader to divide by Z after we've multiplied it by our "fudgeFactor". // Divide x and y by z. We also need to update the code to let us set the fudgeFactor. If it's not clear drag the "fudgeFactor" slider from 1.0 to 0.0 to see what things used to look like before we added our divide by Z code. It turns out WebGL takes the x,y,z,w value we assign to gl_Position in our vertex shader and divides it by w automatically. We can prove this very easily by changing the shader and instead of doing the division ourselves, put zToDivideBy in gl_Position.w. and see how it's exactly the same. Why is the fact that WebGL automatically divides by W useful? Because now, using more matrix magic, we can just use yet another matrix to copy z to w.
We can add the plus 1 we had before with this matrix since we know w_in is always 1.0. So, let's modify the program again to just use matrices. Next let's make a function to make our Z → W matrix. and we'll change the code to use it. and note, again, it's exactly the same. All that was basically just to show you that dividing by Z gives us perspective and that WebGL conveniently does this divide by Z for us. What's going on? Why is the F disappearing early? Just like WebGL clips X and Y to values between +1 to -1 it also clips Z. What we're seeing here is where Z < -1. I could go into detail about the math to fix it but you can derive it the same way we did 2D projection. We need to take Z, add some amount and scale some amount and we can make any range we want get remapped to the -1 to +1. The cool thing is all of these steps can be done in 1 matrix. Even better, rather than a fudgeFactor we'll decide on a fieldOfView and compute the right values to make that happen. Here's a function to build the matrix. This matrix will do all our conversions for us. It will adjust the units so they are in clip space, it will do the math so that we can choose a field of view by angle and it will let us choose our Z-clipping space. It assumes there's an eye or camera at the origin (0, 0, 0) and given a zNear and a fieldOfView it computes what it would take so that stuff at zNear ends up at Z = -1 and stuff at zNear that is half of fieldOfView above or below the center ends up with Y = -1 and Y = 1 respectively. It computes what to use for X by just multiplying by the aspect passed in. We'd normally set this to the width / height of the display area. Finally, it figures out how much to scale things in Z so that stuff at zFar ends up at Z = 1. Here's a diagram of the matrix in action. That shape that looks like a 4 sided cone the cubes are spinning in is called a "frustum". The matrix takes the space inside the frustum and converts that to clip space. zNear defines where things will get clipped in the front and zFar defines where things get clipped in the back. Set zNear to 23 and you'll see the front of the spinning cubes get clipped. Set zFar to 24 and you'll see the back of the cubes get clipped. There's just one problem left. This matrix assumes there's a viewer at 0,0,0 and it assumes it's looking in the negative Z direction and that positive Y is up. Our matrices up to this point have done things in a different way. To make it appear we need to move it inside the frustum. We can do that by moving our F. We were drawing at (45, 150, 0). Let's move it to (-150, 0, -360) and let's set the rotation to something that makes it appear right side up. We're back to just a matrix multiply and we're getting both a field of view and we're able to choose our Z space. We're not done but this article is getting too long. Next up, cameras. Why did we move the F so far in Z (-360)? In the other samples we had the F at (45, 150, 0) but in the last sample it's been moved to (-150, 0, -360). Why did it need to be moved so far away? The reason is up until this last sample our m4.projection function has made a projection from pixels to clip space. That means the area we were displaying represented 400x300 pixels. Using 'pixels' really doesn't make sense in 3D. 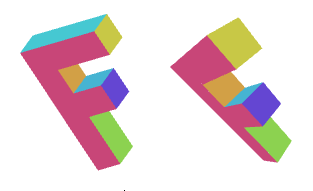 The F has its top left front corner at the origin. The projection looks toward negative Z but our F is built in positive Z. The projection has positive Y up but our F is built with positive Z down. Our new projection only sees what's in the blue frustum. With -zNear = 1 and with a field of view of 60 degrees then at Z = -1 the frustum is only 1.54 units tall and 1.54 * aspect units wide. At Z = -2000 (-zFar) its 2309 units tall. Since our F is 150 units big and the view can only see 1.54 units when something is at -zNear we need to move it pretty far away from the origin to see all of it. Moving it -360 units in Z moves in inside the frustum. We also rotated it to be right side up.